Upon our arrival, we were greeting by a few staff here.. One to register, one to serve u drink, one to provide consultation.. Quite friendly..
At a sitting corner, this is the first interior that you will see.. no diiference from a salon.. but, its more than that…a left turn, you will see a little consultation room with a little, i dono wat’s that called, scalp scanner(!???) and a PC. 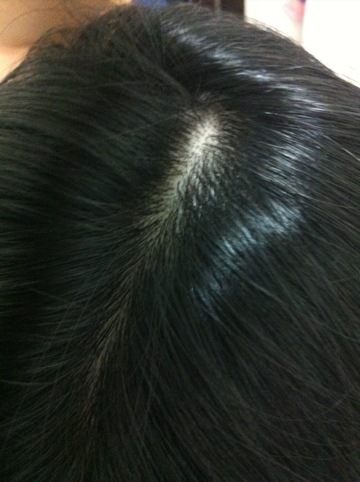 i suspect this (below pic) is my mom scalp! hahaha! cuz she went in the room before me! That is how the customer profile looks like.. 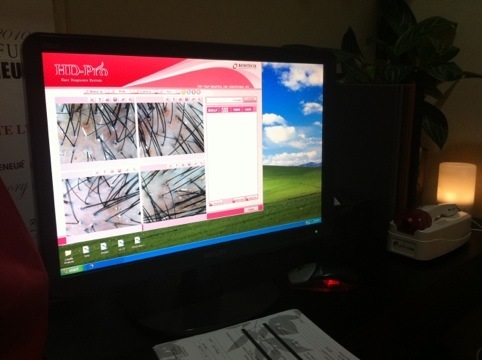 Very friendly consultant.. As she scanned my scalp, she asked a few qn about my diet, my fluid consumption, lifestyle, etc.. she not only tells me what type of treatment i will be receiving later, she also explain to me about the hair cycle and .. Wat i can recall to share is.. an average person has 25 hair cycles. To complete 1 cycle, it takes 3 years.. Something like that… that means, average person will still have hair growth up to 75 years old. Just a matter of more or less. Also, it’s advisable to use organic shampoo as commercial shampoo are quite harmful. Esp those that promised smooth and silky hair. 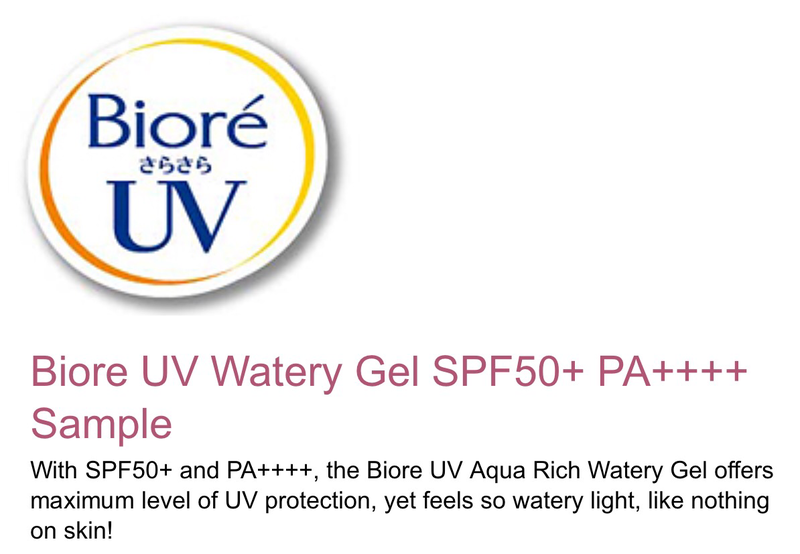 Because what gives you this smooth and silky effects are just silicon.. silicon are bad for our scalp. it will clog up those…. “pore”.. i dono wat’s that HOLE ur hair grow from called!! hahaha.. So, it’s better to use organic ones.. Consultant also advise.. try to use warm water when we begin our shower. Warm water can helps to wash away the excess oil from our scalp and switch to cold water when we’re almost done. Cold water can close up the pores.. i think this is almost a similar theory like skincare..
After all the explaination and consultation, i’m brought to a pte dark room. 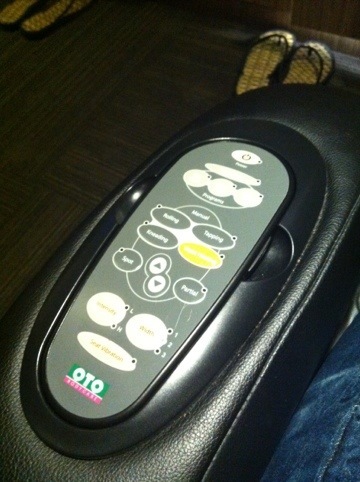 With OTO massage chair, TV and mommy waiting for mi..!! She has already picked her movie when i went in.. Horror show in such embiance .. gosh.. brave mommy! 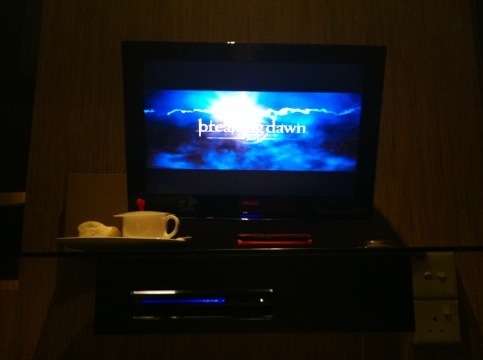 I’m so happy they have Twilight Breaking Dawn.. I haven get to see it since the day it screens! As i get sitted, a hair therapist starts to give me a little information of she’s going to do..
and i’m just noding away as im too excite for my twilight to get started! See!! 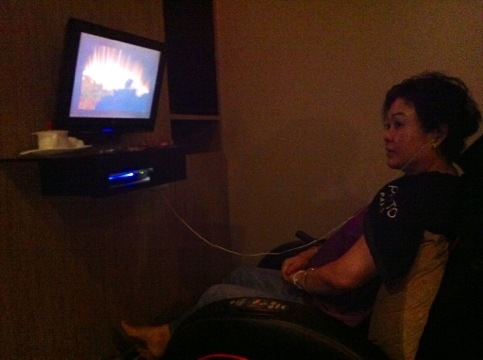 mommy doing hair mask steaming! (sorry for this blurry pic! 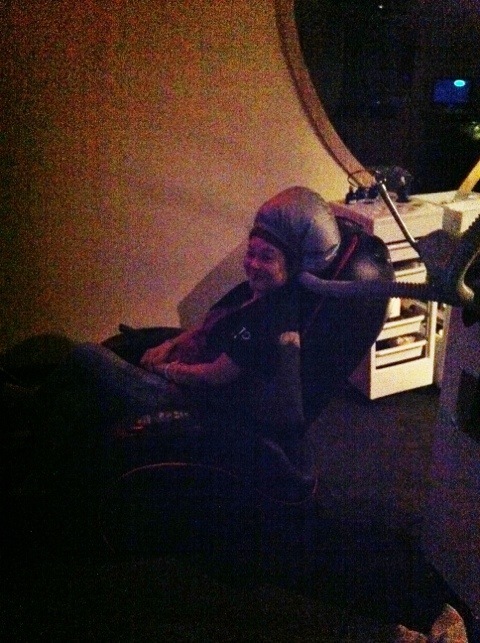 it was too dark in there and i need to brighten this pic thus effect was bad..) Hope she enjoys this Spa session.. 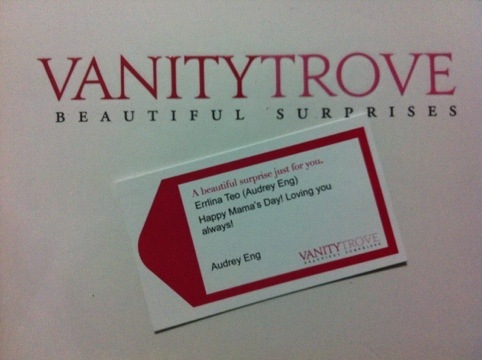 Thanks to PHTYO & VANITYTROVE, we get a chance to enjoy a different type of spa experience..
May Trove – Mothers’ Day Trove! *knock knock* here comes my limited edition Trove! As usual the courier guy called bef arriving! Same guy! 😀 this time I got to thank him!! But… Still din get his name! Anyway this limited edition trove is both good and no good. 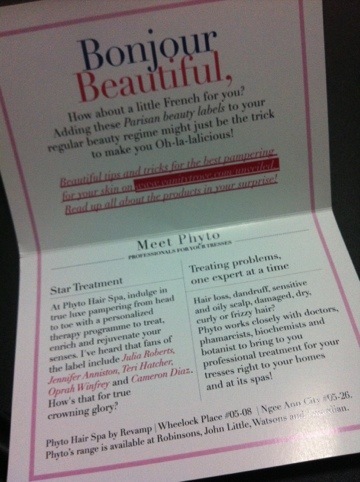 Good if u like Phyto products. No good if u are not a hair product person. 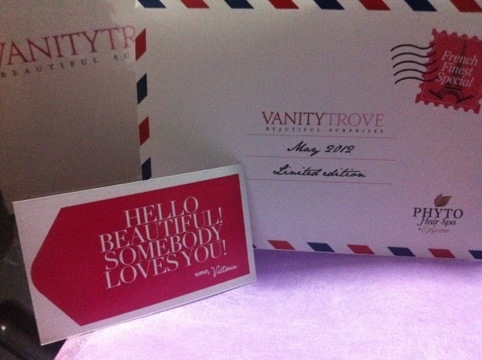 When I opened up I saw this very pretty card.. Airmail design product introduction card w a lil message card for my mom. As I open further.. I kinda see thru the translucent wrapper and knew it was Phyto!! My mom’s favorite!! Lol! But if u were to ask my opinion, I would say I dun really like this month(May) trove. 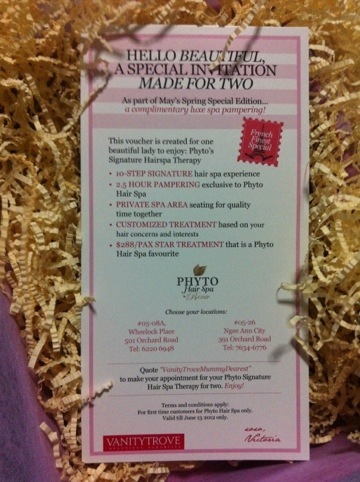 I know Phyto products are expensive but I dun see a point in having 2 shampoo in a box. Made mi feel disappointed. But it’s for mom, as long she’s fine I’m fine. So now! Let’s see wat are these items!! The abv is a shampoo. 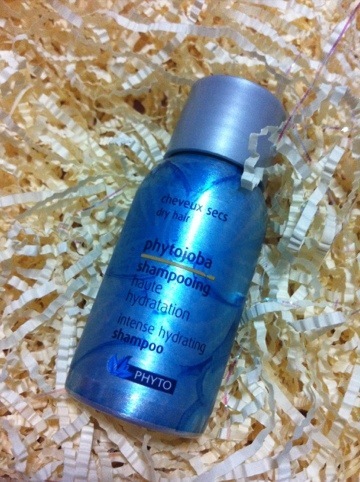 Intense Hydrating Shampoo (50ml) for dry hair. I used a lil teeny weeny bit before gifting to my mom!! Wahahahaha!! Shhh!!!! Well.. I find it a bit too watery (is this normal?) I’m not a Phyto fan so the watery part shocked mi.. I thot VT added water in it! Oops! =X but despite the watery texture, it still perform well.. U do not need a lot of shampoo to lather the form. As for the smell/fragrance, i must be honest. It’s not fantastic. It smells very chemical – and this chemical smell is actually coconut. This is a coconut-based shampoo! No floral no fruity. But again, if it can perform, I dun mind the smell.. The smell is not tt bad but not very fantastic either.. Lol! How to use it effectively: Apply coin-sized amount of shampoo and massage into lather then rinse. Repeat, leaving the lather on for 2 to 3 minutes before rinsing thoroughly. 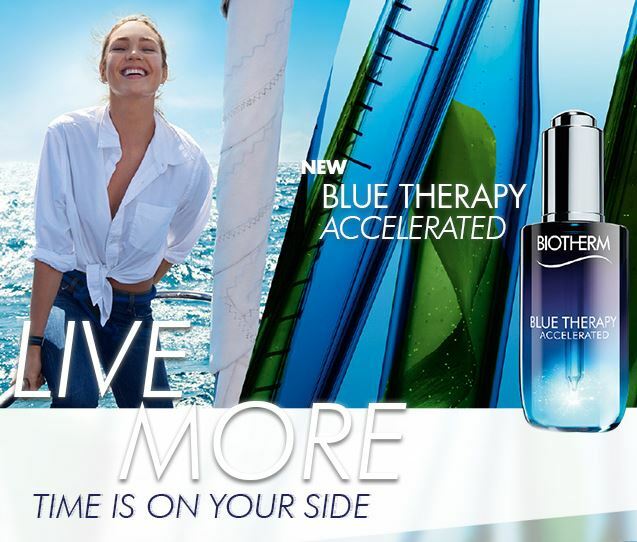 Ingredients: Jojoba Oil, Wood Cellulose, Cornflower and Mallow Extracts, Centaurea Cyanus Flower Extract (Bleuet), Malva Sylvestris (Mallow) Extract (Mauve), Water / Aqua, Sodium Laureth Sulfate (Dérivé D’huile De Coco), Peg-4 Rapeseedamide (Dérivé De Colza), Cocamide Mipa (Dérivé D’huile De Coco), Glycol Cetearate (Dérivé D’huile De Palme), Disodium Cocoamphodiacetate (Dérivé D’huile De Coco), Simmondsia Chinensis (Jojoba) Seed Oil (Jojoba), Cocamidopropyl Betaine (Dérivé D’huile De Coco), Potassium Undecylenoyl Hydrolyzed Soy Protein (Dérivé D’huile De Ricin), Sodium Lauroyl Sarcosinate, Polyquaternium-10 (Dérivé De Cellulose Du Bois),Panthenol (Provitamine B5), Citric Acid, Fragrance / Parfum, Sodium Chloride, Potassium Sorbate, Sodium Benzoate, Methylchloroisothiazolinone , Methylisothiazolinone. 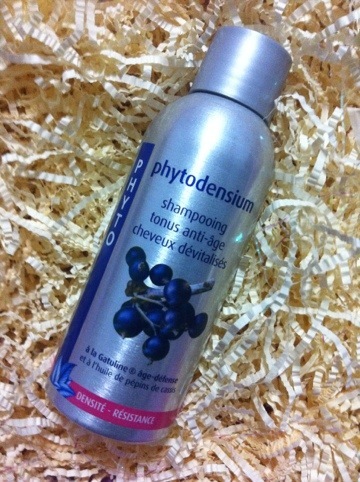 Next is this anti-aging shampoo (100ml)!! Did I see wrongly?? Anti-aging shampoo?? Call mi “sua-gu” by all means! This is my first time seeing “anti-aging” shampoo!!!!! Gosh!! Am I that out-dated!?!! Neither mi nor my mom had used this shampoo. But it smells better than the previous one. Not too sure wat’s the ingredient but is that blueberry I saw on the bot???? 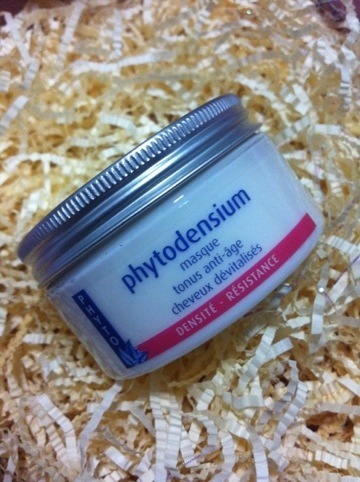 Next this is a masque. Hair mask I suppose, anti-aging hair mask. This is sealed up w foil so I can’t smell anything. Let me find out before I comment on this. Had looked up at VT site, this mask bascially keeps color bright, vibrant, and illuminated with shine. And the blend of citrus fruits and proteins will effectively lock in color, restructure the hair fiber, and boost radiance. How to use it effectively: Spread it onto wet hair, from roots to ends, using a wide-toothed comb then leave on for 2 to 5 minutes. Rinse thoroughly. Use daily in conjunction with Phytocitrus shampoo for two weeks after color-process, then alternate with a hydrating shampoo such as Phytojoba. Ingredients: Grapefruit Extract, Sweet Almond Proteins, Colza Oil, Althaea Officinalis Root Extract (Décocté De Guimauve), Cetearyl Alcohol, Behentrimonium Methosulfate (Dérivé D’huile De Colza), Ricinus Communis (Castor) Seed Oil (Huile De Ricin), Prunus Amygdalus Dulcis (Sweet Almond) Protein (Amande Douce), Stearyl Alcohol, Propylene Glycol, Glycerin (Dérivé D’huiles Colza / Ricin), Citrus Grandis (Grapefruit) Fruit Extract (Pamplemousse), Zea Mays (Corn) Oil, Ceteareth-33, Butyrospermum Parkii / Shea Butter (Beurre De Karité), Shorea Stenoptera Butter (Beurre D’illipé), Amodimethicone, Cetrimonium Chloride, Benzyl Alcohol, Quaternium-80, Fragrance / Parfum, Trideceth-12, Panthenol (Provitamine B5), Hydrolyzed Keratin, Water / Aqua, Chlorphenesin, Methylisothiazolinone , Citric Acid, Tocopherol, Beta-Carotene. Okok!!! Now this is what I’m all excited about!!!! A spa for two!!! 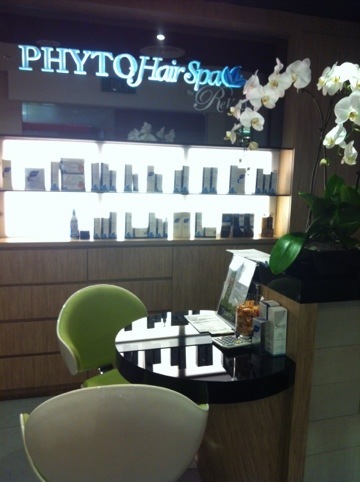 Kinda surprised it’s a hair spa!!! 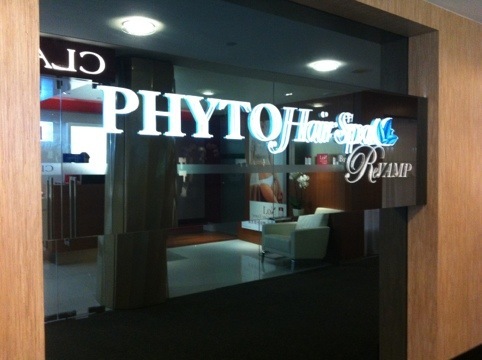 By Phyto, worth $288/pax and it’s a 2.5hr hair spa experience! Gosh! 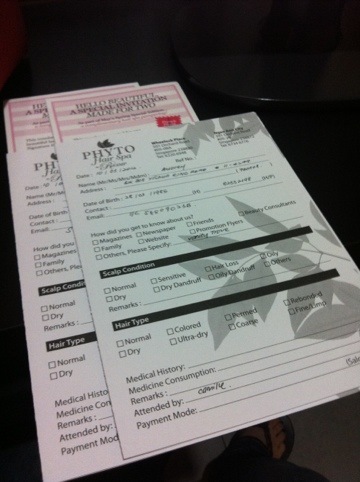 This is totally like a Phyto Box!I wonder what others got? Hahaha! First time going for a hair spa with mom!! 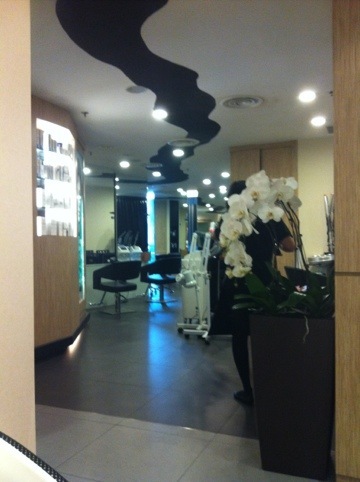 Hope mommy will enjoy this pampering session!! I think VT can have a little more improvement. 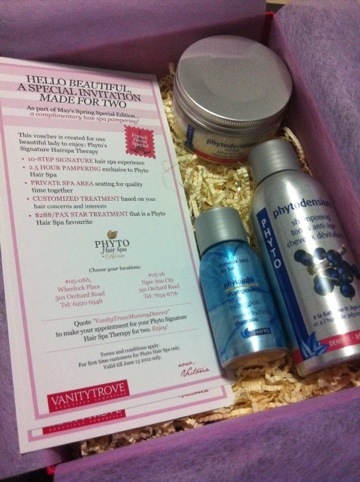 .i suggest they include a lil note to elaborate what each item in the box is/are.. better still if able to advise user how to use the product.. I’ll take an example like the hair masque.. if i don’t know Phtyo is a hair care product, i would happily thot that it’s a face mask – anti-aging mask somemore! and now that i know its a hair mask, i don’t know how to use it.. how long shd i leave it on my hair..? before or after shampoo? how frequent can i use it..? i believe a little note like this can help user better understand the product and encourage them to use/try it.. rather than “oh, i don’t know how to use” and leave it aside.. waste money and waste VTeam effort to recommend good stuff to people.. Be more pro-active and take the initiate..